Sometimes, I’m just too tired to cook. I know, shocking, but after a long afternoon of shopping, all I want to do is lay down. So, on these days, I usually just take whatever I have in the fridge. throw it all together, and call it a meal. But there are times when these haphazard cooking days actually turn out amazing. One example of this is my spiced fried rice. 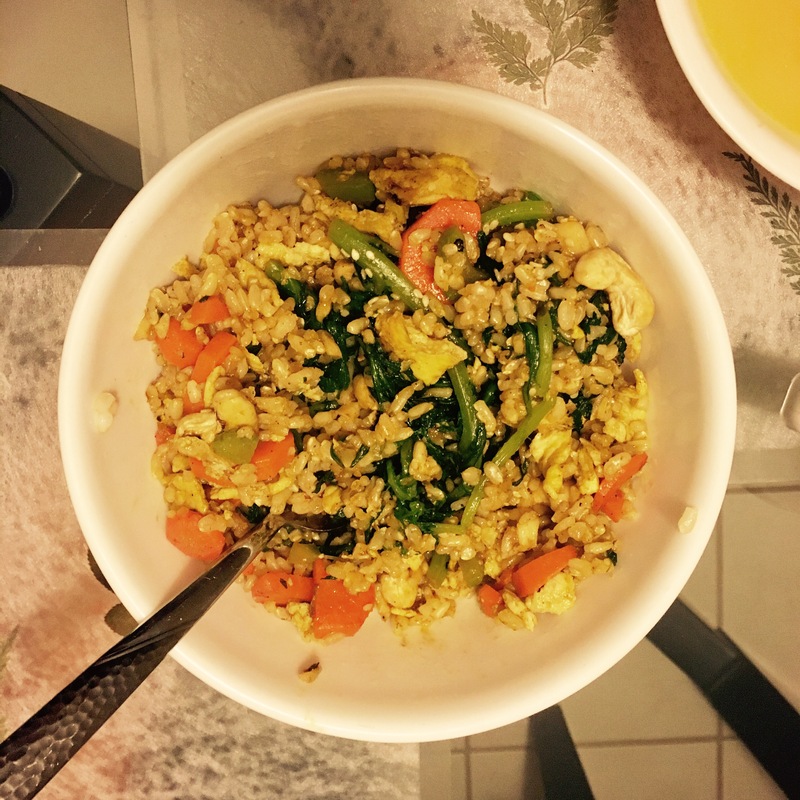 I’m not going to lie, there were a lot of ingredients I used (mainly from spices) as this is a spiced Fried Rice. But trust me, it is good. Especially when you’re tired because the heartiness of this dish just warms you right up. Also, each spice that I use has a plethora of health benefits associated with it. For example, turmeric is strongly anti0inflammatory, has powerful antioxidant effects, and prevents common diseases overall. I use pepper in this recipe because it helps the body absorb the turmeric more effectively. Note: These ingredients can be substituted for other similar ingredients! This recipe is meant to be a clean-out-the-fridge, whatever-you-have-on-hand type of recipe. For example, you can switch out brown rice for white rice, or the dark leafy greens for broccoli. The possibilities are endless. 1.) Heat half of the olive oil (1tsp) in a pan, and then scramble the two eggs. Remove from pan. 5.) Add the rice, and some liquid to help break up any clumps. I used bone broth that I of course had leftover, but you can also use water or another type of broth. Add the soy sauce, cashews, and sesame seeds. 6.) Give everything a good mix and you’re done! What is your favorite leftover recipe?